Over a year ago, this action figure became the subject of some controversy due to a photograph published online by one of the hosts of the Marvelicious Toys podcast. 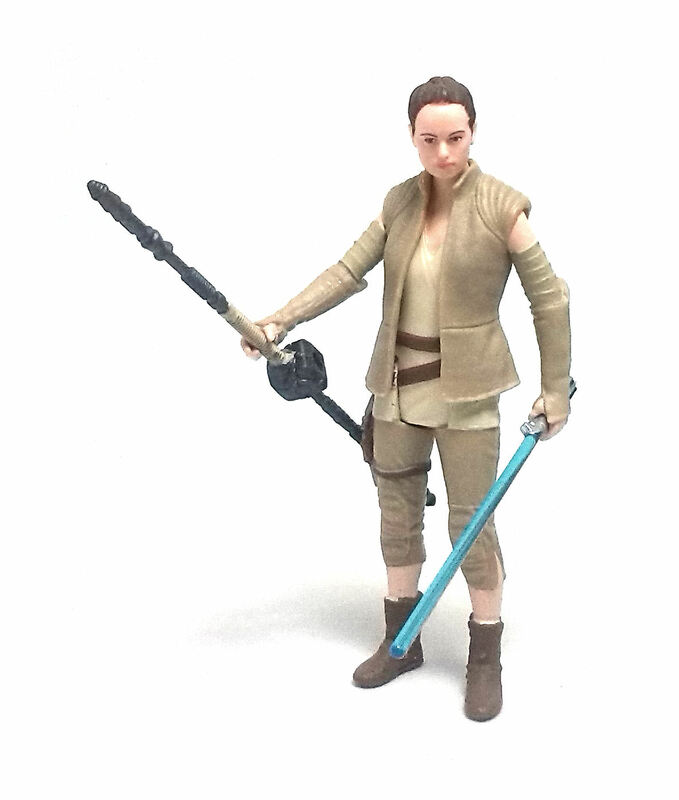 Turns out this particular version of Rey was not supposed to be available for sale at the time, even though said host did find his figure hanging at the pegs in a Wal-Mart store. 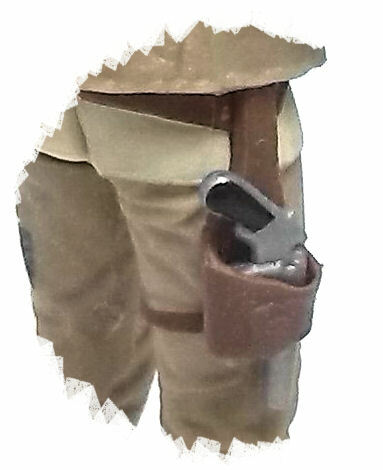 A number of letters of cease & desist were sent by the stewards of the Star Wars franchise and social media accounts were briefly suspended because one of the accessories included with this figure was considered to be a big spoiler for the yet unreleased film; but more on that in a moment. 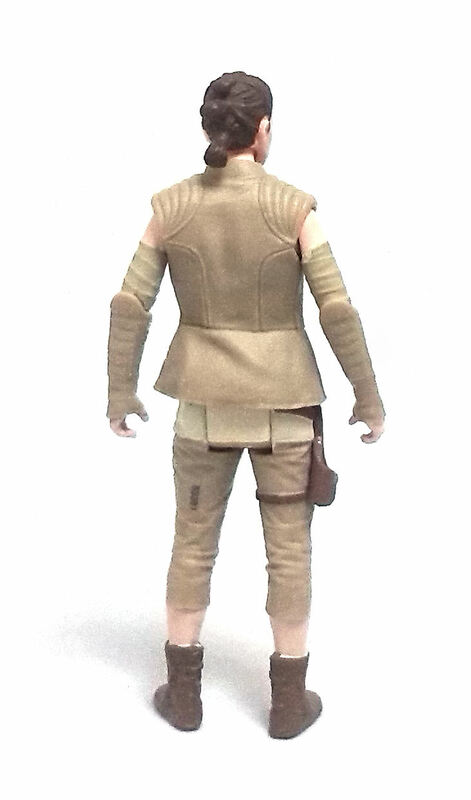 Rey’s vest is removable and made from pliable plastic. It does not look too bulky and the figure even looks fine without it. The rest of her garments are fairly simple, but they still display a good amount of sculpted detail. 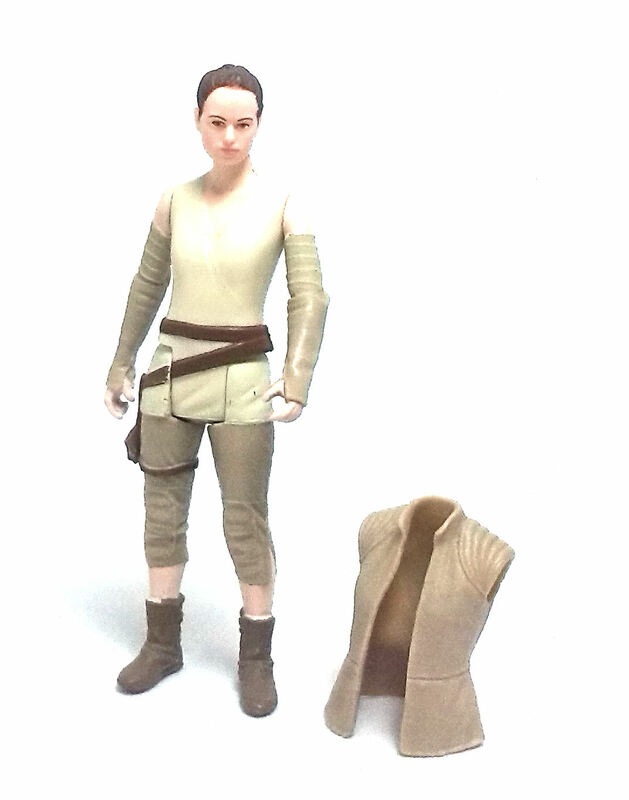 The head sculpt is new, as it has Rey’s trademark hairdo from the movie but not the strands framing the face from her Starkiller version. 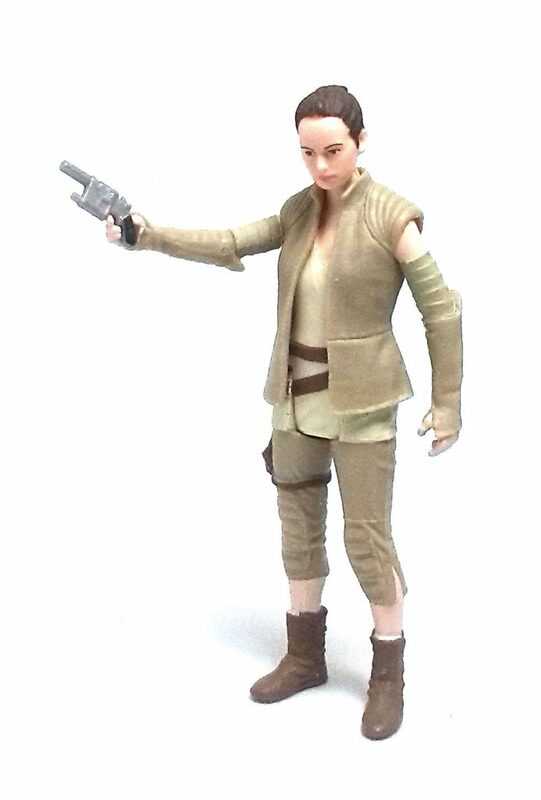 I would not go as far as to say I see a real resemblance to actress Daisy Ridley, but I suspect that has more to do with the paint job than the actual sculpted portrait. The overall pose of this Rey figure is fairly relaxed, which works well with the reduced articulation these figures have nowadays, even though the vest shoulders prevent the arms from shooting straight up. The paint job on Rey looks deceptively simple, but you can find two or three different colors applied on each limb to convey her assorted garments. The face has very little of it, but at least her eyes are painted clean and straight. 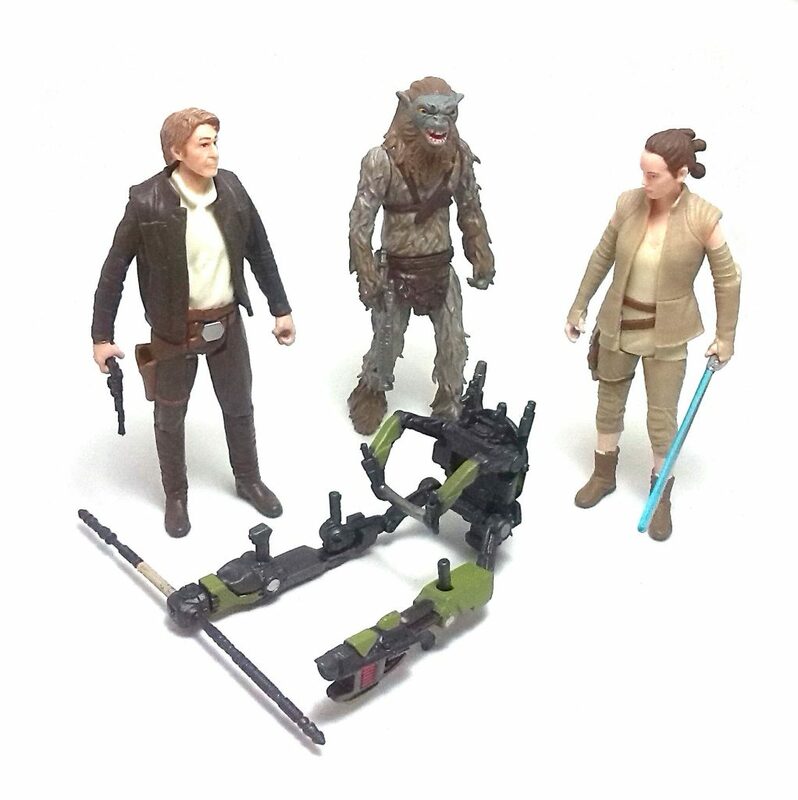 Resistance Base Rey comes with a few interesting accessories; one is a small blaster pistol she can carry on a functional holster sculpted into her right leg, a staff with a strange block stuck right in the middle, an extra accessory for the Build-A-Weapon gimmick and the blue-bladed lightsaber that was the cause of all the drama surrounding the posting of the initial pictures. If you ask me, Hasbro could have prevented any issues caused by this image if they had just included the lightsaber with Finn, who was actually the one character that we had already seen using it in the movie trailer, but then again, What do I know about marketing? Before closing, let me talk a bit about the Build-A-Weapon pieces included here. 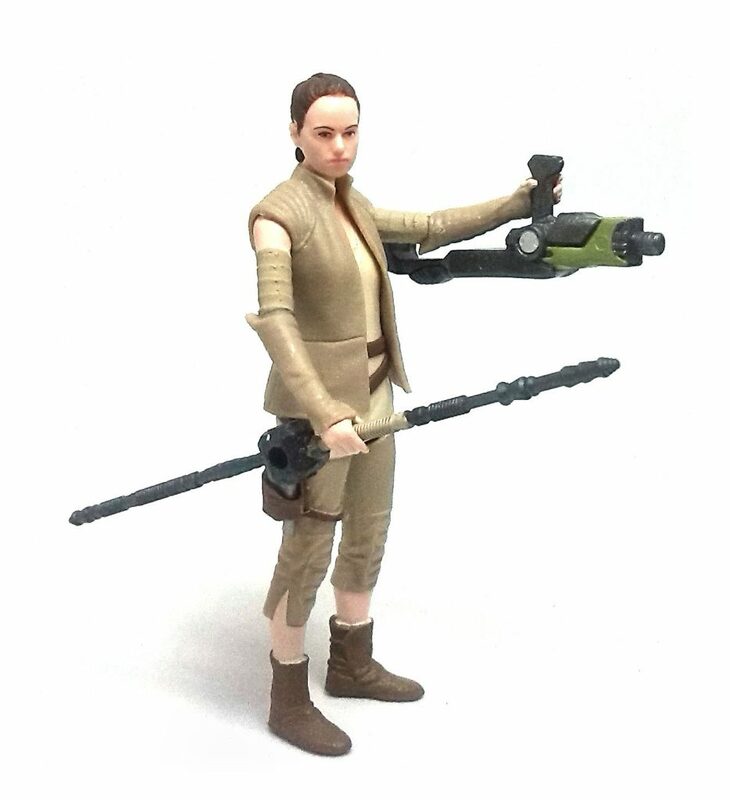 So, Rey has this staff with a weird cube on the middle, which also has a peg hole in it. Turns out, the nozzle of the extra weapon thingy is meant to go in there and produce a rather absurd contraption, which in turn combines with the pieces from the Ep. VII Han and that of the Hassk Thug to make an even more cumbersome contraption. Thing is, this finished piece is actually useless for these limited articulation figures, as they lack elbow articulation to actually grab hold of the yokes in the arms of this device, so this is a case where the BAW pieces work better separated than together.